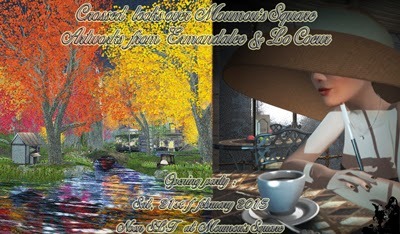 On Saturday, February 21st 2015 at noon SLT Moumou’s Square will host a beautiful exhibition showing artworks from Ermandalee and Lo Coeur. Both artists have been asked by Trinity Yazimoto, owner of this beautiful garden, to work on inedit artworks about the place all landscaped by the so talented Trixxie Nitely. Ermandalee’s works are always an eye catcher. Her choices for angles and colors are always amazing giving often a feeling of reality to her artworks. Lo Coeur also has her own signature. Her pics looks like water paints. Her romantic style is her signature. Both artists have their own style and this is what made Trinity choose them for this special request. She wanted the exhibition being an ode to this beautiful garden and to the beauty of Nature in general. The exhibition will show 2 series of 10 artworks from both artists all over the wonderful garden. It will run from the 21st of February till March 21st. The event will start with an opening party on the 21st at noon SLT with the participation of Hippie Bowman as DJ. So come by, visit the exhibit, have a drink (or two) and enjoy the party. If you can’t be at the opening, you’ll have one whole month to visit this beautiful art show.